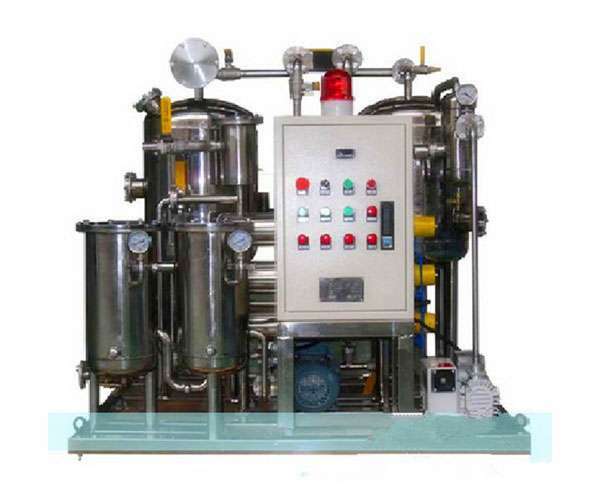 The purifier is a next-generation vacuum oil purifier designed for phosphate ester fire-resistant oil system, utilizing dehydrating and degassing technologies such as anti-precipitation ,aggregation separation, transformation resolution ,vacuum entrapment and flash evaporation, which not only speedily removes the free water in oil but also intensively removes the dissolved water and gas in oil . The stage-to-stage density filter element made of new composite materials can remove the large amount of impurities in oil and results in a precision filtration. Application of new absorptive materials can effectively absorb the jelly substance in oil, and eliminate the acid content in oil, as well as inhibiting the production of new acid in the system. The purifier body is made of acid dissolving resistant stainless steel; filter element and seal are made of materials which are compatible with fire-resistant oil, being of nice look, light weight, easy to operate, low noise and longer lifetime. It is widely applied to phosphate ester fire-resistant oil system and mechanical equipment.